His reign is already solidified and virtually unchallenged. P.J. Tucker is the NBA’s sneaker king. He has shoes in his collection that hypebeasts can’t even cop, and he actually wears pairs that the biggest sneakerheads in the world wouldn’t even dare to unbox. “With playing basketball and sneakers, there’s no line,” Tucker told Joe La Puma on Complex’s Sneaker Shopping in early March. “If I have them, I’ll play in them.” And, on the huge stage of the NBA playoffs, Tucker didn’t hold back. In Houston’s 17 games during the 2018 postseason, Tucker broke out 22 different pairs of size 14s, while averaging 8.9 points, 6.5 rebounds and shooting 46.7 percent from 3-point range. He wore Jordans, LeBrons, Kobes, KDs, Kyries — you name it. He found sneakers that were only meant to be sported by high school players, and represented on his feet colleges the former University of Texas student never attended. This is the complete list of every shoe P.J. Tucker wore in every Rockets game during the 2018 playoffs. The sneakers of P.J. Tucker of the Houston Rockets during the first half of Game 1 against the Minnesota Timberwolves in the first round of the 2018 NBA playoffs on April 15 at the Toyota Center in Houston. The sneakers of P.J. Tucker of the Houston Rockets during the second half of Game 1 against the Minnesota Timberwolves in the first round of the 2018 NBA playoffs on April 15 at the Toyota Center in Houston. 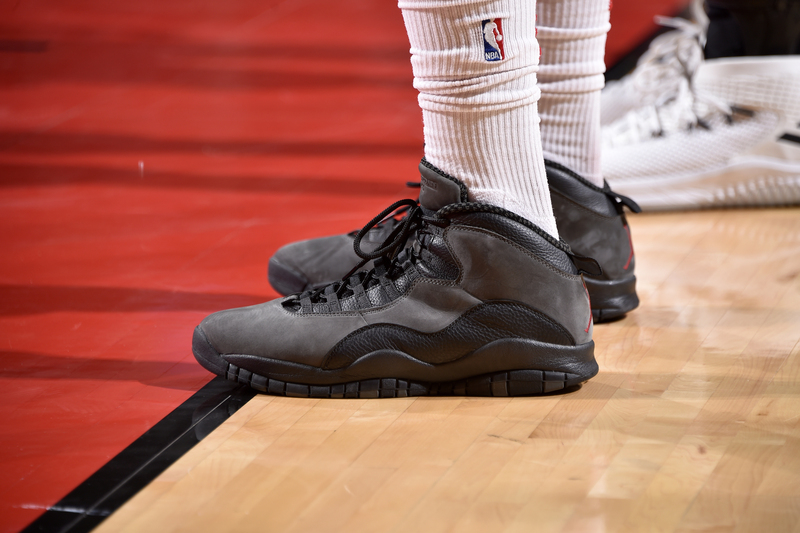 Tucker walked through the tunnel of the Toyota Center before the Rockets’ postseason opener with a pair of “Flu Game” Air Jordan 12s in his left hand. He then warmed up in a pair of “Stealth” Air Jordan 3s. 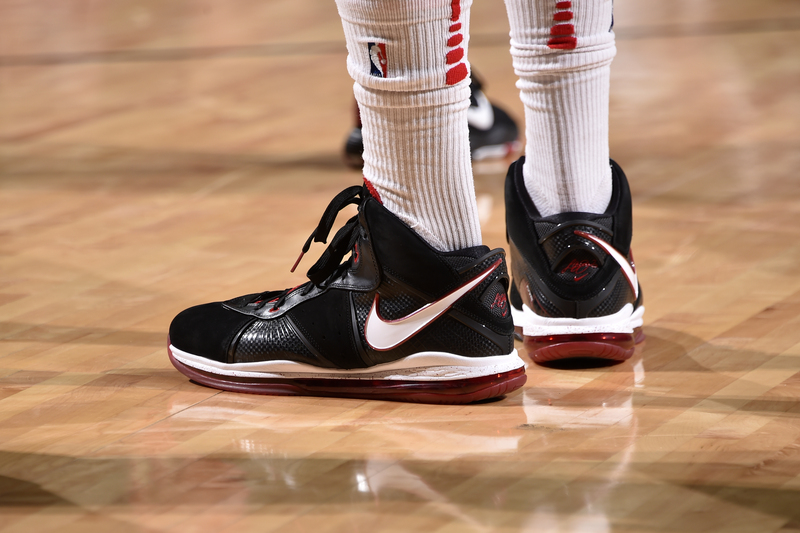 Come game time, he ran up and down the hardwood in two more pairs of kicks: the “4 Horseman” Nike LeBron 3 Lows during the first half and the “Rossa Corsa” Air Jordan 32s during the second half. What a way to start off the playoffs — with four different sneakers. The sneakers of P.J. Tucker of the Houston Rockets during the first half of Game 2 against the Minnesota Timberwolves in the first round of the 2018 NBA playoffs on April 18 at the Toyota Center in Houston. 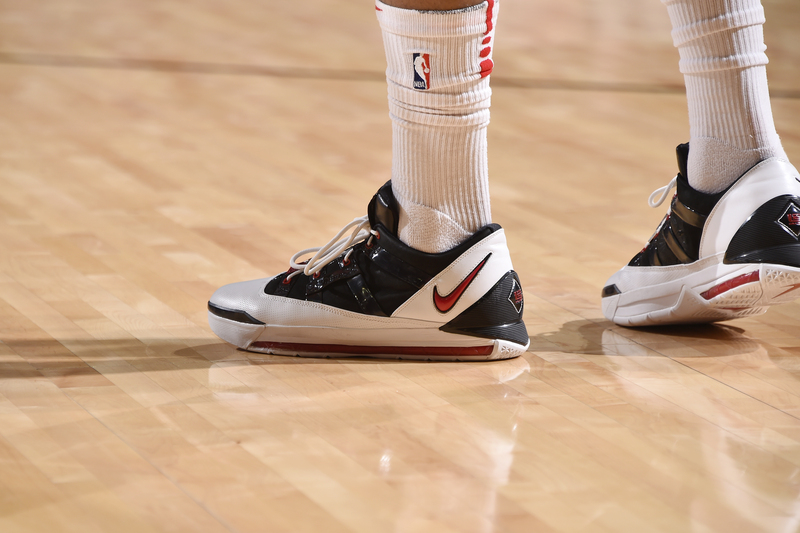 The sneakers of P.J. Tucker of the Houston Rockets during the second half of Game 2 against the Minnesota Timberwolves in the first round of the 2018 NBA playoffs on April 18 at the Toyota Center in Houston. 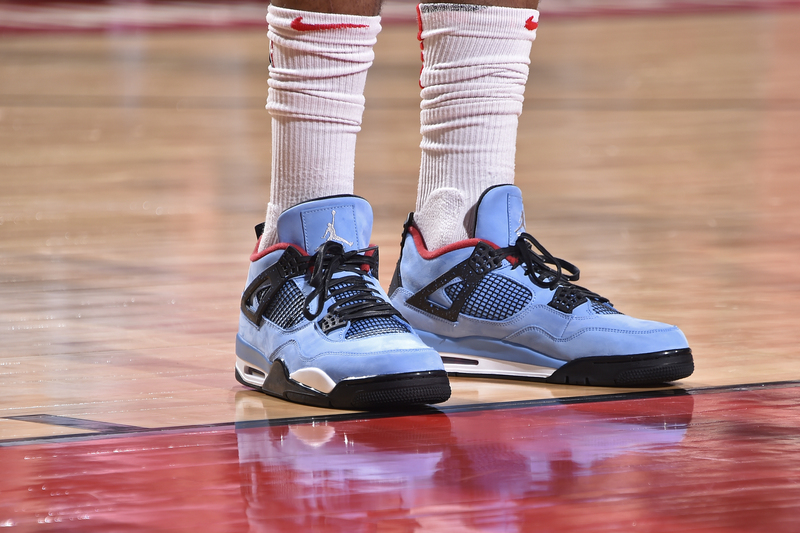 Sitting courtside during Game 2 of the Western Conference quarterfinals, rapper and Rockets superfan Travis Scott, a native of Houston, donned a pair of his own signature shoes, the “Cactus Jack” Air Jordan 4s. 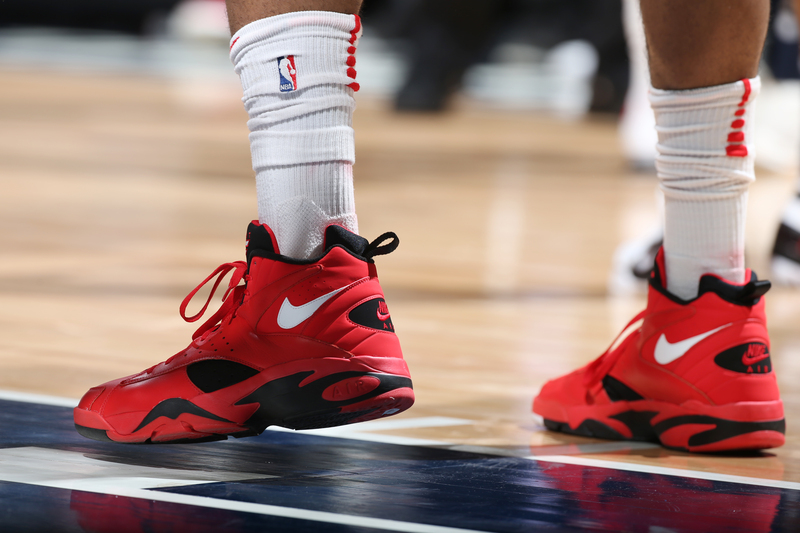 On the court, Tucker wore them too. It’s worth noting: The shoes, inspired by the colors of the city’s former NFL franchise, the Houston Oilers, haven’t officially dropped yet — and won’t until late June. But Trav and Tucker debuted the heat, which the Rockets forward wore only briefly. 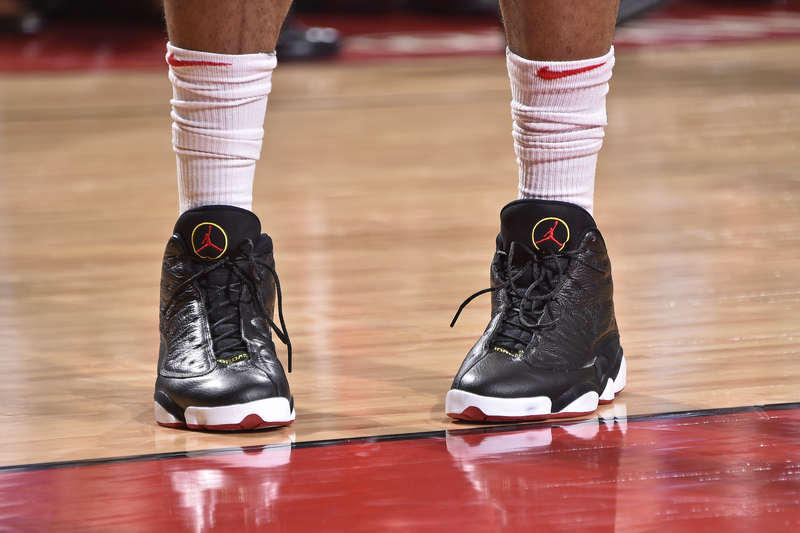 In the second half against Minnesota, he played in a pair of “Playoffs” Air Jordan 13s. The sneakers of P.J. Tucker of the Houston Rockets during the first half of Game 3 against the Minnesota Timberwolves in the first round of the 2018 NBA playoffs on April 21 at the Target Center in Minneapolis. The sneakers of P.J. Tucker of the Houston Rockets during the second half of Game 3 against the Minnesota Timberwolves in the first round of the 2018 NBA playoffs on April 21 at the Target Center in Minneapolis. 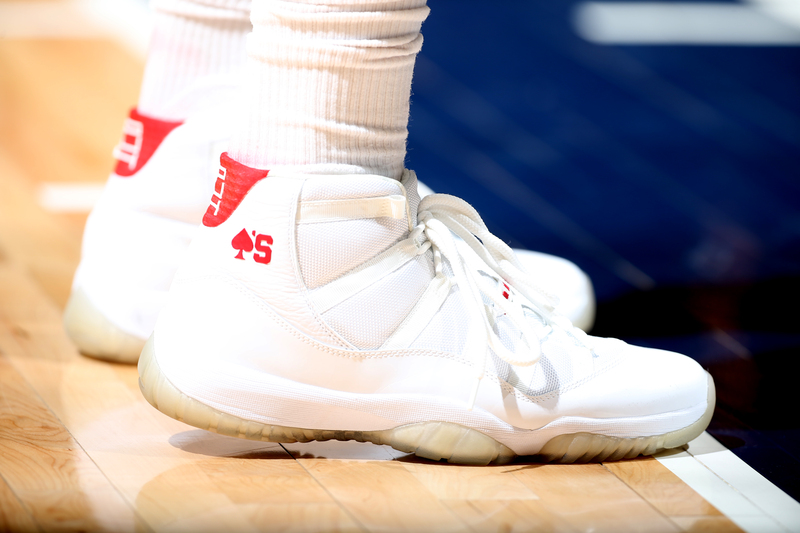 It took only three games for Tucker to break out some custom kicks: a pair of white Air Jordan 11s dubbed the “Aces.” On the heel of the shoes, a red spade replaces the traditional Jumpman logo, and “PJ4” replaces Michael Jordan’s jersey number in the thinly lined, trademark script. Tucker switched his shoes in the locker room at halftime of the road Game 3. This time it was to a pair of “Trifecta” Air Maestro 2s (worn by Scottie Pippen in a triple-double performance in the 1993 NBA Finals) from Nike’s “Art of a Champion” collection. The sneakers of P.J. Tucker of the Houston Rockets during Game 4 against the Minnesota Timberwolves in the first round of the 2018 NBA playoffs on April 23 at the Target Center in Minneapolis. 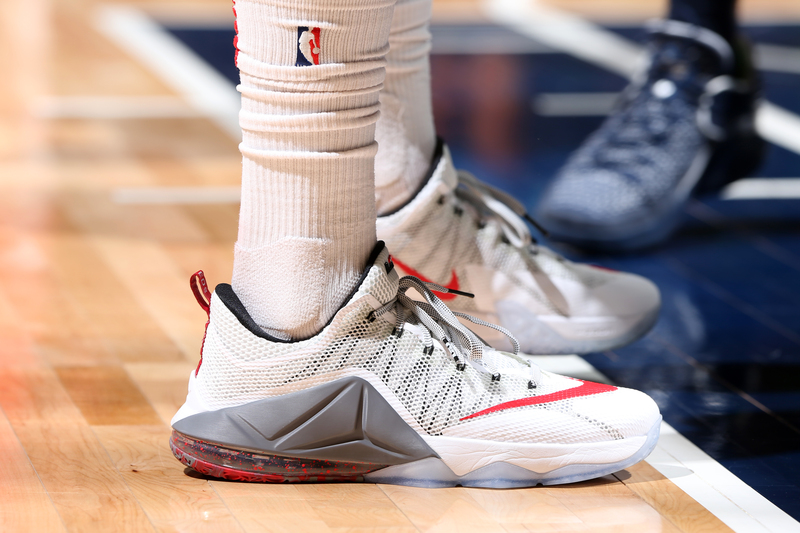 In Game 4 against Minnesota, for the first time in the playoffs, Tucker wore only one pair of shoes: white, gray and red Nike LeBron 12 Lows. Perhaps he left his second-half sneaks in his hotel room. Or maybe he just got tired of spoiling us with a footwear fashion show. The sneakers of P.J. Tucker of the Houston Rockets during the first half of Game 5 against the Minnesota Timberwolves in the first round of the 2018 NBA playoffs on April 25 at the Toyota Center in Houston. The sneakers of P.J. Tucker of the Houston Rockets during the second half of Game 5 against the Minnesota Timberwolves in the first round of the 2018 NBA playoffs on April 25 at the Toyota Center in Houston. On April 8, Michael Jordan’s billion-dollar company hosted its annual showcase for the nation’s top high school prospects. 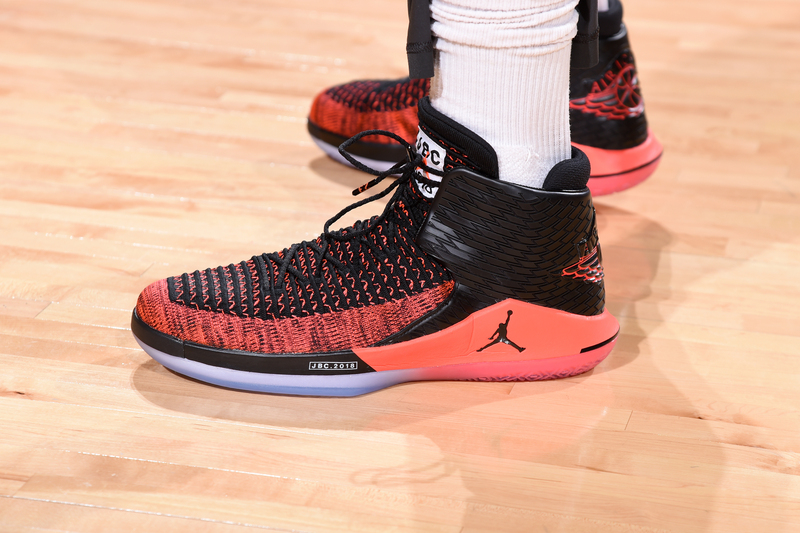 While competing in the Jordan Brand Classic, young stars wore pairs of player-exclusive (PE) Air Jordan 32s, embossed with “JBC 2018” logos on the midsole and tongue. Tucker is 33 — a decade and a half removed from his prep days at William G. Enloe High in Raleigh, North Carolina. 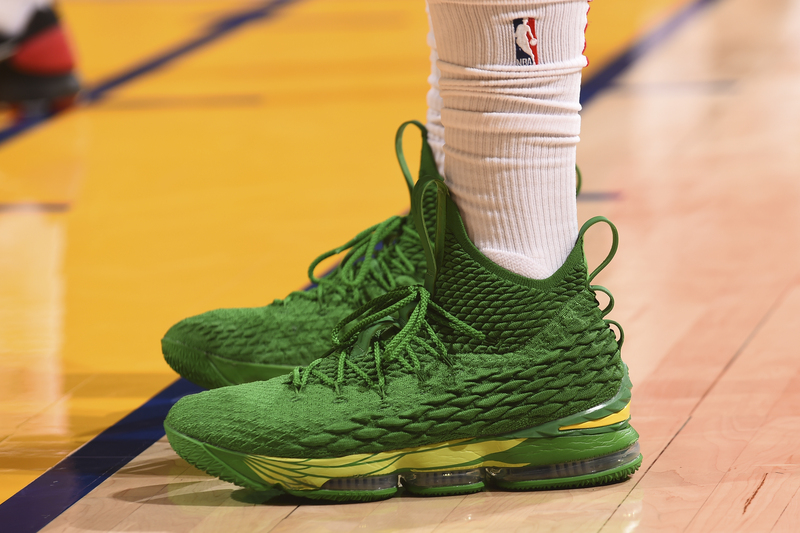 But, somehow, he landed all five pairs of shoes that every JBC player received, including the PE 32s, which he rocked a few weeks after the high school all-star game in a closeout Game 5 win over the Timberwolves. For the second half, he swapped out the 32s for a pair of “Dark Shadow” Air Jordan 10s, which were released on April 20. 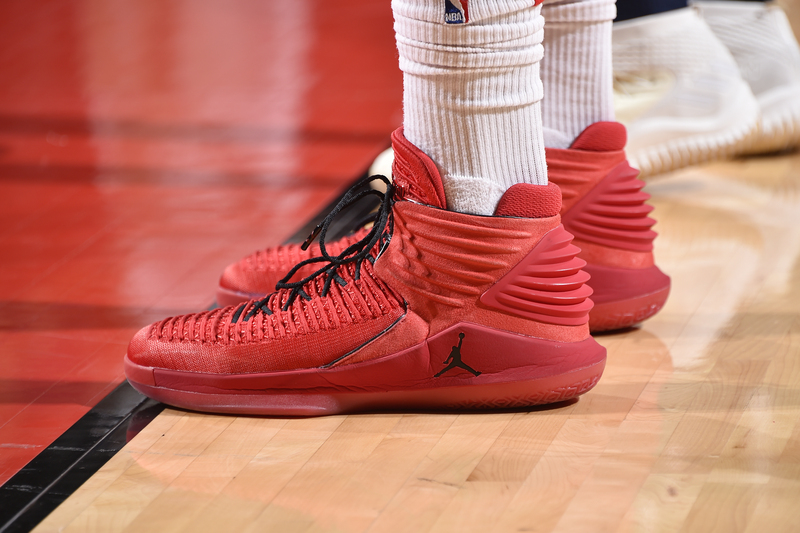 The sneakers of P.J. Tucker of the Houston Rockets in Game 1 of the Western Conference semifinals against the Utah Jazz during the 2018 NBA playoffs on April 29 at the Toyota Center in Houston. Before Game 1 of the Western Conference semifinals between the Houston Rockets and Utah Jazz, a photo surfaced of Tucker sitting in his team’s dressing room as he sifted through a huge pile of sneakers and boxes that flowed out of his locker. 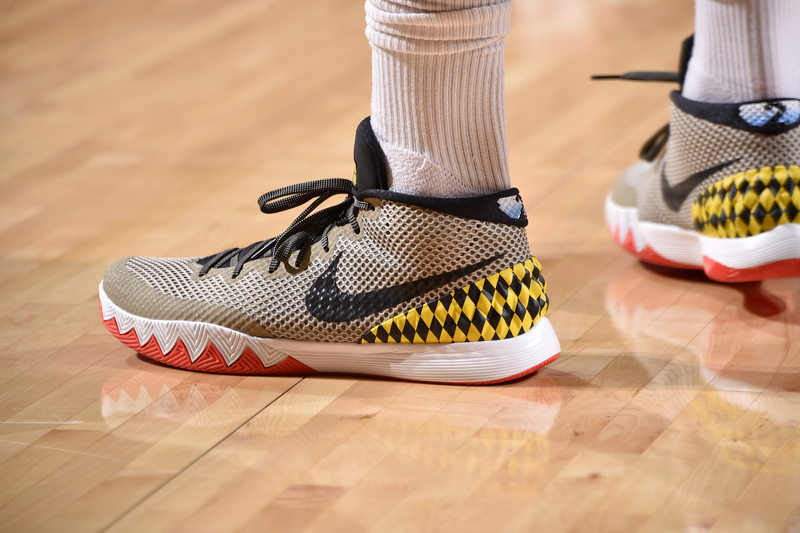 For the series opener, he decided to throw it back with a pair of “Warhawk” Nike Kyrie 1s, which are inspired by the World War II-era Curtiss P-40 fighter aircraft. The shoes were released in 2015 and were given exclusively to high school and college players who participated in the Nike Basketball Academy in the Barker Hangar at Santa Monica, California’s airport. But of course Tucker got his hands on a pair — because the shoe term “limited edition” means absolutely nothing to him. The sneakers of P.J. Tucker of the Houston Rockets during the first half of Game 2 against the Utah Jazz in the Western Conference semifinals of the 2018 NBA playoffs on May 2 at the Toyota Center in Houston. P.J. 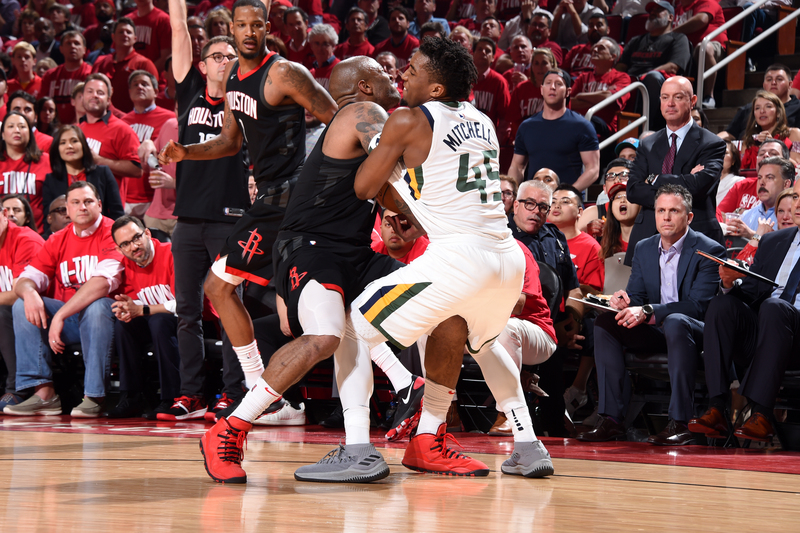 Tucker of the Houston Rockets and Donovan Mitchell of the Utah Jazz wrestle for a rebound during Game 2 of the Western Conference semifinals in the 2018 NBA playoffs on May 2 at the Toyota Center in Houston. The University of Oregon — located about two hours south of Nike’s headquarters in Beaverton, Oregon — is the land of milk and honey when it comes to PEs. Tucker must have a reliable plug on campus, as he’s no stranger to whipping out pairs of shoes that only the university’s athletes, past and present, should have. 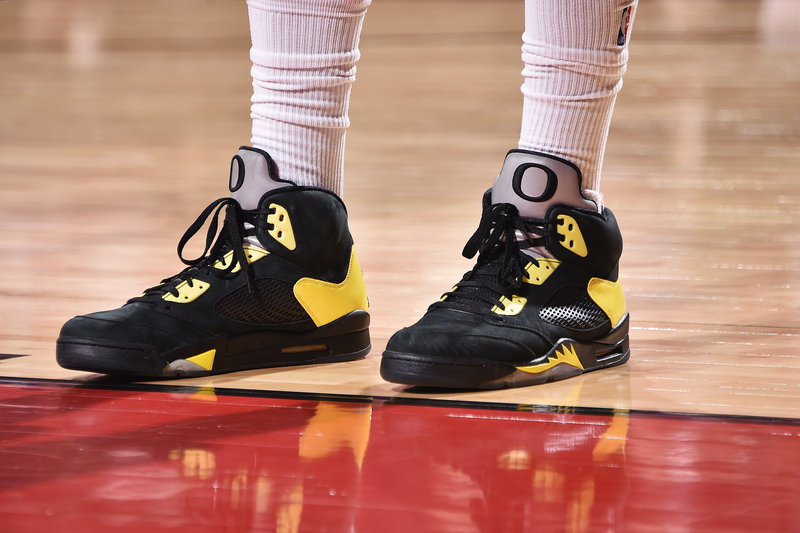 In Game 2 against the Jazz, he wore a pair of “insanely rare” PE “Oregon” Air Jordan 5s, but only for the first two quarters. In the second half, he sported the “University Red” Air Jordan 10s, a collaboration between the Jordan Brand and famed NBA tattoo artist Steve Wiebe that dropped exclusively at House of Hoops in Harlem, New York, in December 2017. Two pairs of superuncommon shoes in one game. All in a day’s work for Tucker. The sneakers of P.J. Tucker of the Houston Rockets in Game 3 of the Western Conference semifinals against the Utah Jazz on May 4 at the Vivint Smart Home Arena in Salt Lake City. The Chinese New Year, also known as the Spring Festival, kicked off this year on Feb. 16 and lasted through March 2. 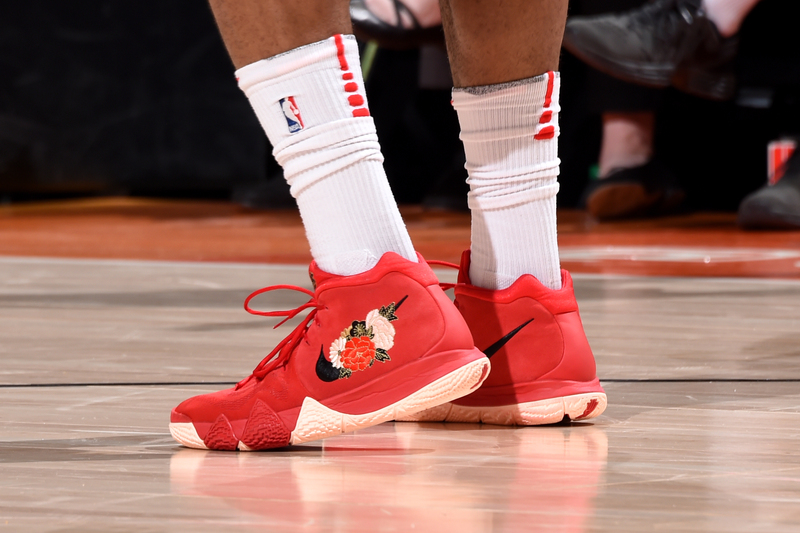 But Tucker was still celebrating the Year of the Dog in early May, when he showed off the “Chinese New Year” Nike Kyrie 4s in Salt Lake City for Houston’s first road game of the Western Conference semis. Tucker is a mixologist with the colors of his on-court shoes, often choosing to turn heads instead of matching his uniform. But these kicks, which feature a beautiful red, black and gold floral design on the quarter panel of each shoe, perfectly complement Rockets team colors. Well done, P.J. Well done. The sneakers of P.J. Tucker of the Houston Rockets in Game 4 of the Western Conference semifinals against the Utah Jazz on May 6 at the Vivint Smart Home Arena in Salt Lake City. From the conservative “CNY” Kyrie 4s in Game 3 to the vibrant “D.C. 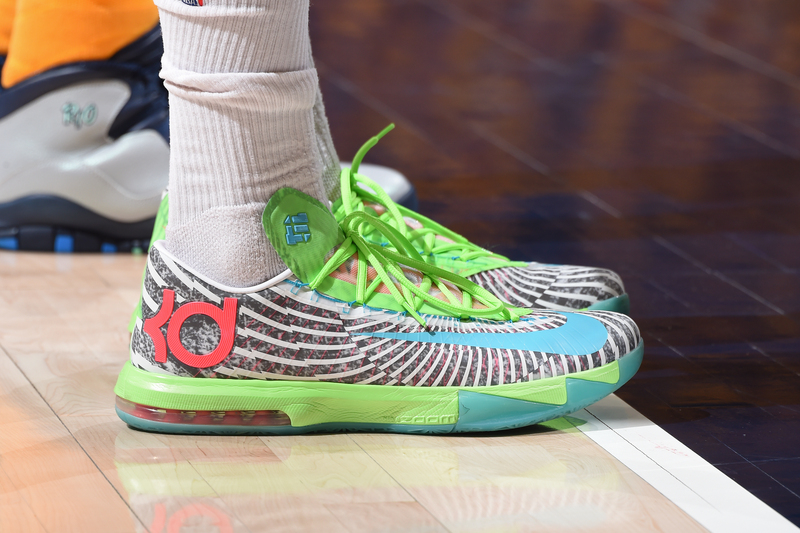 Preheat” Nike KD 6 Supremes in Game 4. Tucker had to go deep in his closet for this pair of Kevin Durant signatures, which first hit the streets in 2013. More proof that his sneaker versatility is crazy. The sneakers of P.J. Tucker of the Houston Rockets during Game 5 against the Utah Jazz in the Western Conference semifinals on May 8 at the Toyota Center in Houston. Why not pay homage to the most dominant player of this year’s playoffs: LeBron Raymone James? With a pair of vintage red-and-black Nike LeBron 8s (which originally released in October 2010), that’s exactly what Tucker did when he and the Rockets sent Donovan Mitchell and the Utah Jazz packing with a Game 5 win that advanced Houston to the Western Conference finals for the first time since 2015. The sneakers of P.J. Tucker of the Houston Rockets during Game 1 against the Golden State Warriors in the NBA’s Western Conference finals on May 14 at the Toyota Center in Houston. In 2008, players on the basketball team at Los Angeles’ Westchester High received exclusive red, black and white Nike Kobe 3s. They were personalized for the school, with each shoe’s tongue featuring a “W.” So how did Tucker, who went to high school in North Carolina from 1999-2000, find a pair of these unique Kobes? Perhaps Rockets forward Trevor Ariza, a Westchester graduate, hooked his teammate up. But with Tucker, who really knows? The “Westchester” 3s he wore in Game 1 of the Western Conference finals against the Warriors might just be one of the original pairs. That’s how deep his shoe connections run. The sneakers of P.J. Tucker of the Houston Rockets during Game 2 against the Golden State Warriors in the Western Conference finals on May 16 at the Toyota Center in Houston. Tucker is a Longhorn at heart. 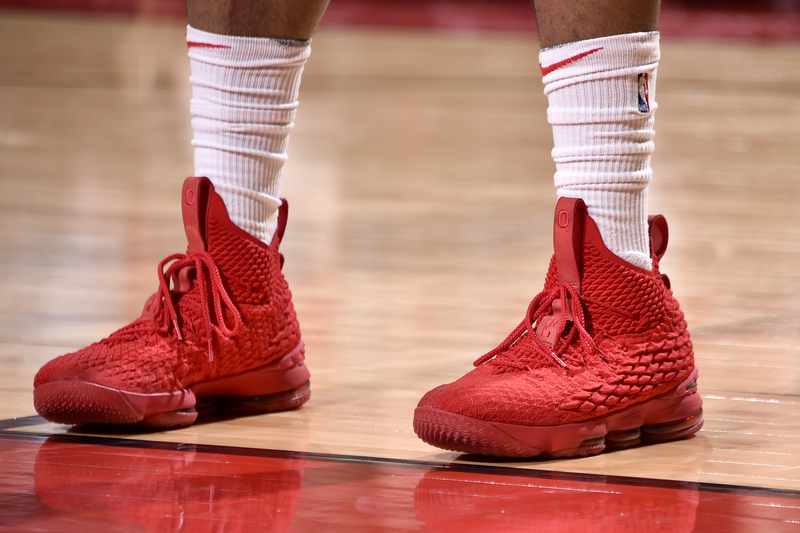 But in Game 2 vs. Golden State, he was a Buckeye, repping THE Ohio State University in a pair of all-red, player-exclusive Nike LeBron 15s. They were presented to the OSU basketball team last fall as part of James’ everlasting dedication to the school he would’ve attended had he gone to college. Also, don’t forget: We’ve seen Tucker in another colorway of Ohio State LeBron 15 PEs. The first pair, primarily in white, was apparently just the warm-up. The sneakers of P.J. Tucker of the Houston Rockets during Game 3 against the Golden State Warriors in the Western Conference finals on May 20 at Oracle Arena in Oakland, California. In 2009, only 36 pairs of the “Yellow Lobster” Nike SB Dunk Lows were made. Nearly a decade later, Nike paid tribute to the iconic skateboarding sneaker with a bigger, yet still limited, release of the “Yellow Lobster” Kyrie 4s. Before lacing up the kicks in Game 3 against the Warriors, Tucker arrived to Oracle Arena in a magenta suit. He was really in his bag with his style choices that night. The sneakers of P.J. Tucker of the Houston Rockets during Game 4 against the Golden State Warriors in the Western Conference finals on May 22 at Oracle Arena in Oakland, California. 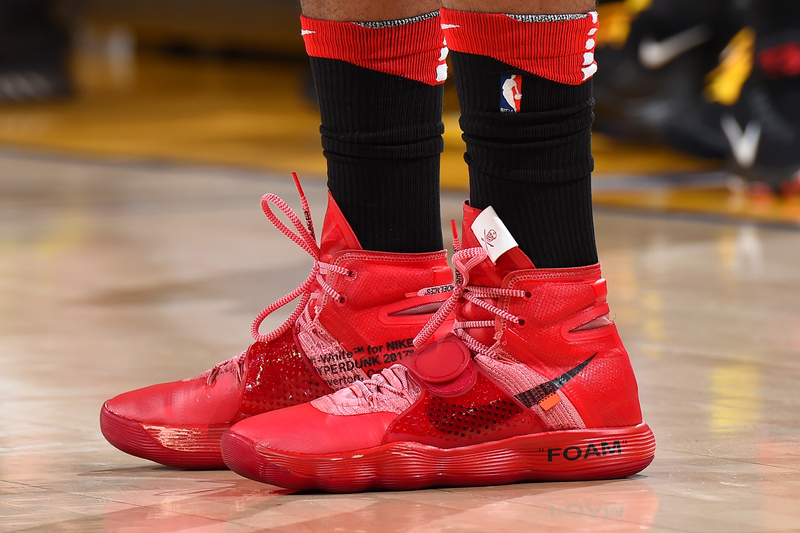 Between Games 1 and 2 of the Western Conference finals, Tucker took to Instagram, where he posted a photo of one-of-a-kind OFF-White Nike React Hyperdunks — the work of sneaker craftsman Dominic Chambrone, aka The Shoe Surgeon. 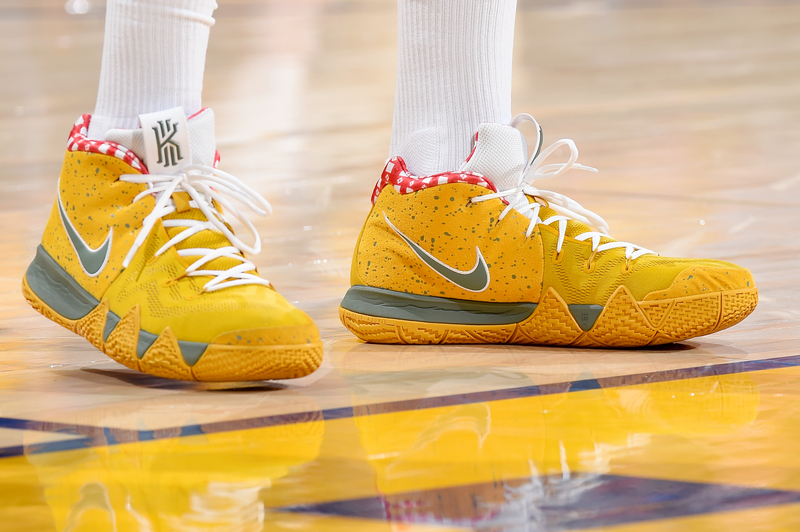 Tucker teased the custom kicks in warm-ups, but they didn’t grace the court until Game 4. To really appreciate the collaboration between Tucker and Chambrone, you have to remember what a normal pair of the OFF-WHITE Hyperdunks look like. Moral of the story: They started out as white and ended up an intoxicating red. A true masterpiece. The sneakers of P.J. Tucker of the Houston Rockets during Game 5 against the Golden State Warriors in the Western Conference finals on May 22 at the Toyota Center in Houston. 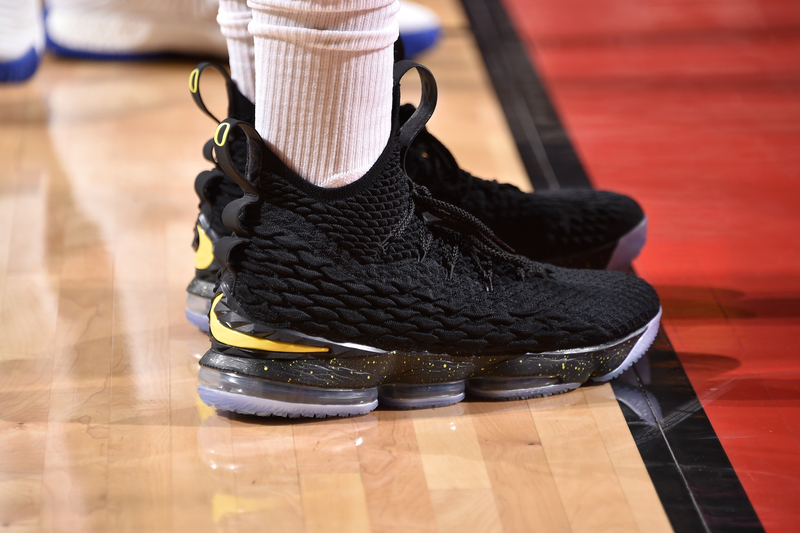 From afar, Tucker’s Game 5 shoes appeared to be a simple pair of black LeBron 15s. Yet, up close you’ll notice the subtle “O” on the heel tab, which signifies one thing: Oregon. Somebody in the school’s equipment department must really love Tucker. The sneakers of P.J. Tucker of the Houston Rockets during Game 6 against the Golden State Warriors in the Western Conference finals on May 26 at Oracle Arena in Oakland, California. In the words of the one and only DJ Khaled, “Another one!” — Tucker’s third pair of Oregon player exclusives in the playoffs. Peep the yellow duck wings design on the midsole of these green beauties. The university might as well hire him to teach “PEs 101.” He’s as well-versed as they come on the topic. The sneakers of P.J. Tucker of the Houston Rockets during Game 7 against the Golden State Warriors in the Western Conference finals of the 2018 NBA playoffs on May 28 at the Toyota Center in Houston. Tucker entered Houston’s home arena before a decisive Game 7 vs. Golden State on Memorial Day carrying a pair of “Grinch” Nike Kobe 6s (the best Christmas Day sneakers in NBA history — and don’t even think about @ing us). But when he and the Rockets stepped foot on the court, with a trip to the 2018 NBA Finals on the line, Tucker had pulled an okey-doke. 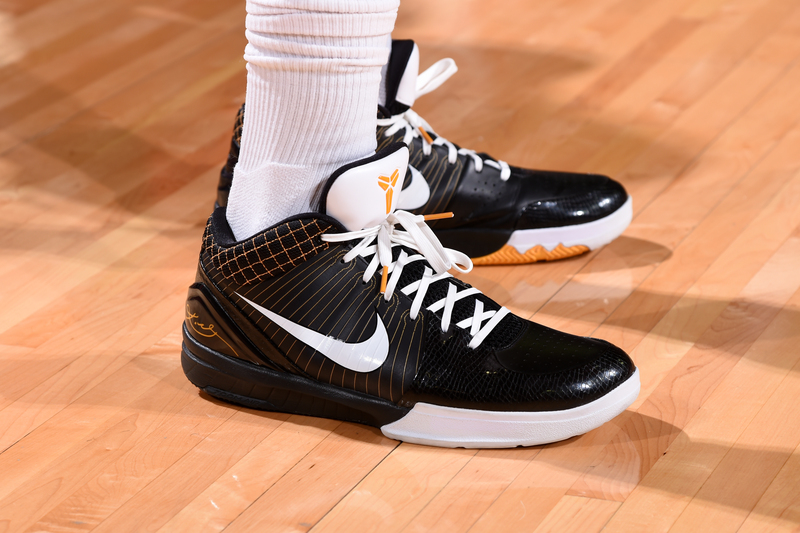 Instead of the Grinches, he wore “Del Sol” Nike Kobe 4s. Yet he couldn’t quite channel his inner Black Mamba, as the Warriors closed out the 2017-18 season for the Rockets. 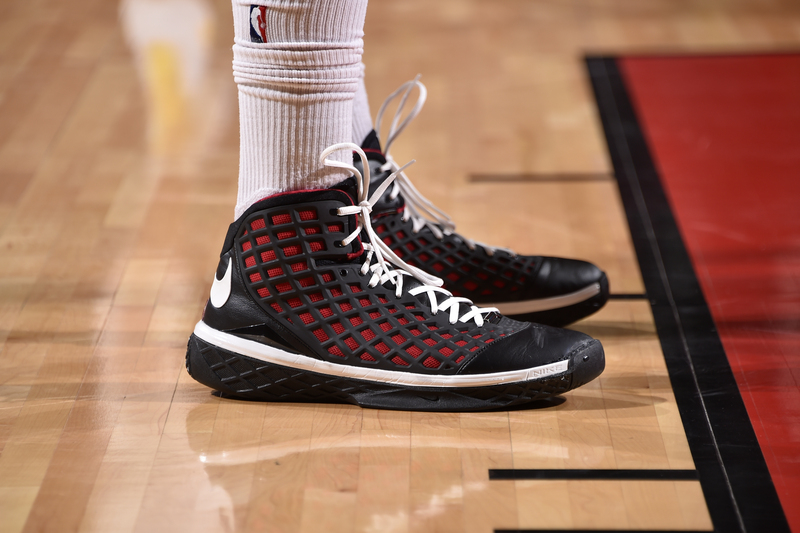 There’s little doubt, however, that Tucker had the freshest shoes of the night — and of the entire playoffs.